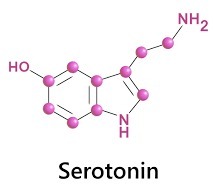 Serotonin is a neurotransmitter, a chemical found in the body that regulates sleep, body temperature, mood, learning, memory formation, appetite, and sexual desire. It’s the main brain chemical involve with helping us feel relaxed and happy, keeping us in a generally positive mood. A serotonin imbalance can trigger mental health issues, such as obsessive compulsive disorder (OCD) and even depression. If you have a serotonin deficiency, you may experience symptoms of depression and anxiety. Other symptoms of a lack of serotonin include binge eating and cravings, low self-esteem, frequent migraines, anger, and being easily overwhelmed. Severe PMS symptoms, sleep problems, and fibromyalgia are also linked to a serotonin deficiency. Fortunately, there are ways to regulate serotonin levels if you have an imbalance. For many people, regular exercise, light therapy, and making some changes in the diet can increase serotonin production in the body. However, the effects of these changes can take some time which is why we recommend serotonin supplementation. Supplementation with serotonin bathes the neurons in the brain with those feel-good chemicals that promote feelings of contentment, well-being, and comfort. A physician typically starts with a smaller dose of serotonin and works up to the desired dose. You can supplement with oral serotonin once every 24 hours. While antidepressants have helped many people suffering from depression get relief from symptoms, studies show that chronic use of antidepressants, such as Prozac and Cymbalta, will deplete the body’s serotonin levels. Treatment with prescription serotonin, however, will increase serotonin levels naturally and can also have a positive effect on depression. If you have too much serotonin circulating in your body (serotonin syndrome), you might experience symptoms such as diarrhea, muscle rigidity or even seizures. Too much serotonin can cause excessive nerve cell activity which can lead to rapid heart rate, heavy sweating, confusion, nausea, and tremors. Antidepressants and other medications that increase serotonin can cause severe symptoms that can be life threatening. Contact us if you have questions about your prescription for serotonin or other supplements and prescriptions recommended by your physician.